Celebrities, influencers and everyday working individuals alike have found great success in weight loss and overall health by following a low carb meal plan. Compared to other crash diets, eating low carb is attractive because it is the easiest to incorporate into your everyday life. There is no counting calories, just carbs! Eating low-carb can be as easy as ordering a steak and veggies at dinner and skipping the bread at the beginning. It doesn't seem too hard, does it? Like for any diet or just meal-prepping in general, the hardest part is actually coming up with the meals. We have done all of the hard work for you by compiling this list of 10 low carb lunch ideas. All you have to do is focus on staying on track! 1. What Are Low Carb Lunch Ideas? Eating low carb means eating high-fat, high-protein and low-carbohydrate meals. You may be thinking, eating a lot of fat is a good thing? Healthy fats are always good, especially in a low carb diet! 2. How Does Eating Low-Carb Help You Lose Weight? A low carb eating plan does a multitude of things to help you lose weight. By eating primarily protein, your metabolism speeds up, and your appetite slowly diminishes. During the first week, it may seem like you are eating more than you ever have before. Cutting out carbs is a temporary shock to your body, and you might feel like you are never full. You may also have flu-like symptoms as your body detoxes. After your first week, the benefits begin to kick in, so try and push through the first week. By cutting out carbs and eating excess protein and fat, you are essentially lowering your levels of insulin. Rather than your body naturally turning to carbohydrates in order to burn for energy, it begins to burn stored fat. This is why you are encouraged to eat high fat and protein. If you do not eat enough fat while on this diet, you may have symptoms of fatigue and lethargy because your body will not have fuel to burn for energy. A low carb diet is one of the easier diets to follow because whether you are out to eat or cooking at home, foods full of fat and protein are always easy to find. The only difficulty with a low carb diet is resisting sweets and high carb food that are easy and good, like pasta and bread. We reviewed these low carb lunch ideas based on parameters such as ease, taste, features, price and where you can buy them. These lunch ideas have been formatted based on nutrition requirements for those eating low carb. When choosing any of these options, please be sure that if you do not have one of the ingredients, substitute it for an ingredient with equal nutritional value. For example, if you do not have cheese, use an avocado to ensure you are getting enough fat. These low carb lunch ideas range in price from around $2 to $10 per serving. 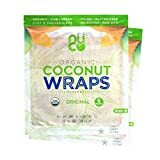 NUTRITIONAL VALUE -This keto friendly, certified organic, all-natural, raw, non-GMO NUCO coconut wrap contains only 70 calories and 4 grams net carbs. Low carbs, NO sugar, NO GUILT! PREMIUM QUALITY- These Certified Organic and Kosher wraps are perfect for your bread alternative needs for sandwiches, tacos, deserts, snacks, crepes, and more. DIET COMPATIBILITY - This Kosher, Certified Organic, All-Natural, Raw, Vegan, Paleo, NON-GMO and NO Salt Added wrap is yeast free. Coconut Wraps contain NO Gluten, Grain, Corn, Soy, Dairy or Egg and are great for vegans, paleo, and Keto diets. COOKING OPTIONS - Perfect for Sandwiches, Tacos,Deserts, and More! Wraps can be used with ingredients, roll it up and can be enjoyed right off the bag. When you think of low carb lunch ideas, you probably don't think of a wrap as an option. However, it is. Low carb diets have become such a common thing in today's society that companies have begun making bread low carb. I know it sounds crazy, but sometimes the low carb bread options are better than your typical gluten and yeast option. For example, these NUCO organic coconut wraps have four carbs per wrap, are gluten-free, paleo, grain-free, soy free, corn free and non-GMO. These wraps are cleaner than most loaves of bread you would buy at the store, and the taste is great. To complete this meal, simply select your favorite meat and veggies. Err on the side of caution when selecting your veggies, and be sure to choose ones with little to no carbs only because you are using a decent amount of your carbs for the meal on the wrap. You can purchase a 10 count of these wraps on Amazon. When you are on a low carb diet, salads become a staple in your everyday meal plan because they are one of the easiest low carb lunch ideas. You throw some greens and veggies together, choose a meat or multiple types of meat and dress it. One of the perks of eating low carb is that most of the best dressings are low carb and high fat. Not all, but a decent few are, like blue cheese and ranch, for example. For this low carb lunch idea, we have selected a lighter, zestier dressing for you. This dressing is lower in calories than most other options but does not skimp on flavor. You can put together this easy salad for less than $5. When searching for low carb lunch ideas, eggs tend to be the center of each meal. Eggs have an adequate amount of fat and protein and are virtually carb- free, making them an essential diet staple if you are eating low carb. Many people associate eggs with breakfast, but eggs are a great meal option for lunch and dinner. The best part about eggs is that you can eat three or even five and you will be full of healthy fats and protein without the carbs that usually come along with similar filling meals. Collect a bunch of your favorite vegetables, and chop them into dice-sized pieces. Put some coconut oil in a pan, and turn it on low heat to help it melt. Whisk the eggs, and pour them into the pan. Turn the pan on medium heat, and cook your eggs until they are around halfway done. Add the veggies, and cook until the eggs and vegetables are fried. You can make this meal for as little as $2 per serving. If you are trying to keep your daily carb intake to around 20 grams, this is one of the best low carb lunch ideas. If you have not had any carbs throughout the day, this is the perfect lunch for you to get your carbs in a nutritious way. A half cup of quinoa has around 17 grams of carbs. Therefore, if you choose this meal, you need to be particularly strict with your carbs for your other meals. This one is very simple. All you have to do is cook the quinoa and then add the rest of the ingredients to it when done. If you would like your spinach wilted, simply cook it on a stove top with a little bit of olive oil before adding it to your quinoa mixture. To add additional flavor, salt and pepper are always good. The dill flavoring will add a nice cool summer kick to the dish. You can make this meal for around $10. If you make more than the serving size, you can use the leftovers for additional lunches. Thai chicken lettuce wraps are a great low carb option to give you some oriental flavor. For this meal, all you need are some big leaves of iceberg or romaine lettuce, chicken and some carrots or peas. You need to purchase a full head of lettuce in order to create the "wrap". Dice up your chicken, and cook it over a stove top. For the Thai flavoring, you can typically buy a bottle of Thai sauce at your local store. This is the easiest option. The only thing you need to be careful of is the carb count in the sauce. Measure the sauce according to the serving size to keep track of how many carbs you are eating. There are also multiple recipes on the internet for low carb sauce options if you have some extra time to cook the sauce. Incorporate peanuts, carrots, peas and any other veggies to your sauce. Then all you have to do is load up your lettuce wraps, and eat! This is one of the tastiest low carb lunch ideas. You can make these wraps for around $15. Since you will most likely be purchasing an entire head of lettuce, make extra chicken and sauce so you have leftovers. Wings and greens are a fun low carb lunch option that even the kids will like. Typical chicken wings, although they are chicken and most people associate chicken with low carb, are breaded and fried, making them pretty high in carbs. For low carb wings, all you have to do is buy uncooked chicken wings from the store. Spread out your wings on a kitchen towel, and let them sit for a couple minutes to dry them out. Then, dump them into a gallon-size bag with some baking powder and salt. Shake them up until each wing is covered, and then bake the wings in the oven. Bake until they are crisp and brown, and then take them out. You can stop here and eat your chicken wings plain, or you can make a low carb version of any of your favorite wing sauces. Douse them in the sauce if you choose, and voila! Add a side of your favorite greens for one of the tastiest low carb lunch ideas. You can make these wings for around $3 per serving. Remember when we said eggs were the star of the show when it comes to eating low carb? We weren't kidding. If all else fails, you can always turn to an easy but classic dish of eggs and bacon. First, cook your bacon to your desired crispiness. When your bacon is done, remove it but keep the pan on the stove with all of the residual bacon bits. Next, get your eggs ready. You can cook your eggs however you like: scrambled, sunny-side up, over easy, fried or even hard boiled. If you choose an egg style that needs to be cooked in a pan, use the bacon grease as your non-stick device, and cook your eggs. You will be left with extra flavorful eggs and a beautiful yet simple lunch. You can cook eggs and bacon for around $2 per serving. Ground beef and peppers are one of the easiest low carb lunch ideas. Literally, all you have to do is dump ground beef into a pan, season with salt, pepper and any of your other favorite seasonings and you are done. If you would like the pepper to be cooked, all you have to do is saute it chopped up with some olive oil. This takes no more than 10 minutes to make and will leave you with leftover ground beef for another meal. You can make this meal for around $3 per serving. When going low carb, what is the one food you fear you will miss most? Nice, big, juicy cheeseburgers! You do have to make a few sacrifices when eating low carb, but thankfully giving up burgers is not one of them. You can eat the burger plus all of the toppings---just skip the bun! This means you can eat two burger patties or more in order to fill up. What is better than getting to eat more without feeling guilty? The best part is, even people who choose to stop eating low carb usually continue eating their burger without the bun after eating it this way. You quickly realize the bun does not really add to the burger. If anything, it takes away from the greasy goodness. You can eat this for around $5 per serving. When you hear the word "fried," you probably do not conclude it is low carb. Well, you are right. Fried food typically isn't low carb because it is doused in flour and breadcrumbs. However, we have a fried chicken recipe to die for. These chicken chunks give the same tasty satisfaction as if you had just inhaled a basket of fried chicken tenders. We use the term "fried" loosely because these chicken chunks are actually baked, but you would never know! For this recipe, purchase skinless chicken wings. The key to keeping it low carb is using ground up pork rinds instead of flour. This adds extra taste as well! You can add any additional seasonings that you would like, and then bake on a tray at 400 degrees. You can purchase this meal for around $5 per serving. If you are not eating low carb at the moment, have these low carb lunch ideas persuaded you? The biggest take away from these lunch ideas is that you do not have to sacrifice taste in order to eat low carb. In fact, people who are not focused on eating low carb often choose these meals because of their great taste and ease. So, what are you having for lunch tomorrow? The Thai Chicken Lettuce Wraps or the Chicken Chunks?